Offering you a complete choice of products which include hc-sr501 adjustir pyroelectric infrared pir motion sensor. It can automatically and quickly open various types of incandescent, fluorescent lamps, buzzer, automatic doors, electric fans, automatic washing machine and dryer Machines and other devices, is a high tech products. Especially suitable for enterprises, hotels, shopping malls, warehouses and family aisles, corridors and other sensitive Sense of region, or for the security zone automatic lighting, lighting and alarm systems. 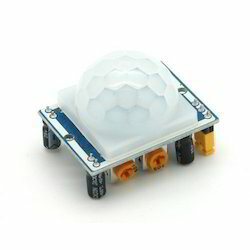 Looking for PIR Motion Sensor ?